I started salivating as soon as I typed those two words. Sorshe Salmon - My favorite way to eat Salmon. Sorshe Salmon is Salmon in Mustard Sauce. The Mustard Sauce in question is not something you get in a jar. Its not a condiment. 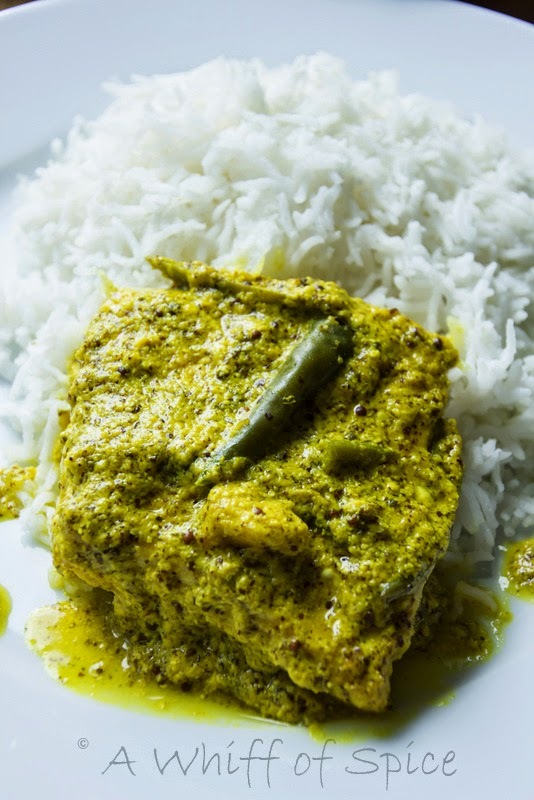 Its a potent, pungent, feisty sauce that evokes a deep nostalgia in every Bengali, especially if they are continents apart from the place they called Home. It's bold; its's gorgeous; it's addictive; its powerful yet comforting. And if you do not treat it with respect, it can give you quite a heartburn! This sauce is the very essence of a Bengali woman. The key to this dish lies in the mustard paste. Black mustard seeds is preferred by the Puritans because of its potency and pungency. For the not-so-bold mortals, we have the yellow ones. And for those in between, its a combination of yellow and black. The mustard seeds are carefully grinded along with chilies and garlic and very little water into a thick, sticky lump, which is then thinned out by adding some more water. The whole mixture is then strained to get rid of any husk. My mom always adds a little yogurt to the mustard paste to mellow it down a notch. Mustard paste is notoriously known to trigger off heartburn and acid reflux. The the probiotics in the yogurt helps counter it. The yogurt also provides creaminess to the overall sauce. The fish is slobbered in the sauce and slow cooked in a moderately warm oven till the creamy salmon and the feisty sauce intertwine in a harmonious union. P.S: Garlic is not commonly used in Bengali Fish Recipes. But garlic complements the flavor of Salmon very well and provides a dept of flavors to the overall mustard sauce. For any other fish (especially Ilish/Hilsa), I would have skipped the garlic altogether. Though Sorshe Salmon is one of my eternal favorite, I do not make it pretty often. Firstly, because Sid is still to get a hang of this spicy sauce. As far as I can remember, even I was not very fond of mustard based dishes when I was a kid. My love affair with all things Mustard(y) started around late teens. Secondly, the sauce is so fiercely delicious and soul satisfactory, that I end up over eating. And Sorshe Salmon is one such dish where I conveniently ditch my Brown Rice and indulge in the guilty pleasures of pearly white Basmati rice. So, without any further ado, lets indulge! - 2 (slit) for garnish. 1. 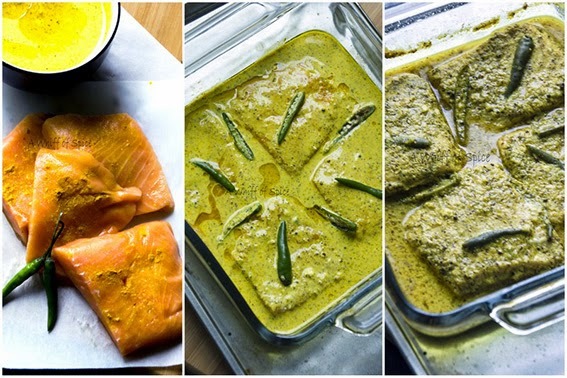 In an oven proof bowl place the washed and pat dried salmon fillets. Rub the fillets with salt and a pinch of turmeric powder. 2. 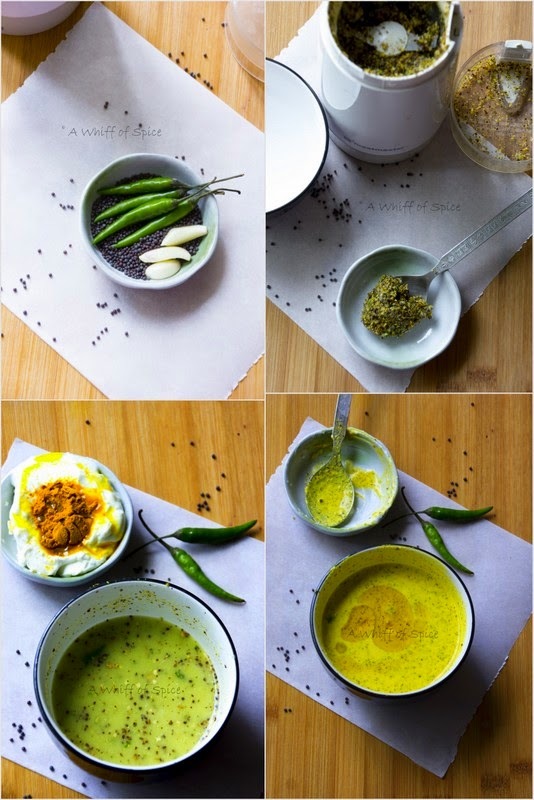 Make a paste of mustard seeds, garlic and green chilies. I make a dry paste in my spice blender and then add water to make it into a thick paste. You would want to strain the mustard paste to get rid of the seed husk. I actually missed doing this step. but its a good idea to strain the paste. Add the yogurt, turmeric powder, salt, and mustard oil to the stained mustard paste and blend well. The resultant sauce will be thick, smooth and creamy. 3. Pour the sauce over the salmon and slobber the fillet completely in the sauce. Add the slit chilies. 5. Cover the bowl tightly with aluminium foil and bake for 45 minutes. 6. Take it out of the oven and let it rest for 10 more minutes before removing the foil. 7. Remove the foil, inhale the 'nose tingling - soul satisfying' aroma. Go to heaven and come back to drizzle the remaining 1 tbsp of oil on the sauce and to garnish with the remaining green chilies. 8. Savor the Sorshe Salmon with hot steamed rice. If you are a true Bengali, the meal must be followed by a lazy siesta! 1. I used only black mustard seed. Black mustard seeds is more pungent than its yellow counterpart. You can use a combination of black and yellow mustard seeds or substitute the entire black mustard with yellow mustard for a milder sauce. 2. The amount of chilies is a personal choice. I like it spicy. Decrease the amount or deseed the chilies for a milder version. but don't leave them out altogether. 3. Mustard oil is non negotiable. The real taste will come out only with good cold pressed Mustard oil. In a pinch Olive Oil can be used, but the flavors will be different but not entirely bad. Avoid flavorless oil. 4. Garlic is not commonly used in Bengali Fish Recipes. But garlic complements the flavor of salmon very well and provides a dept of flavors to the overall mustard sauce. For any other fish (especially Ilish/Hilsa), I would have skipped the garlic altogether. Love your descriptions. 'Nose tingling' .... Aha ki bhalo. 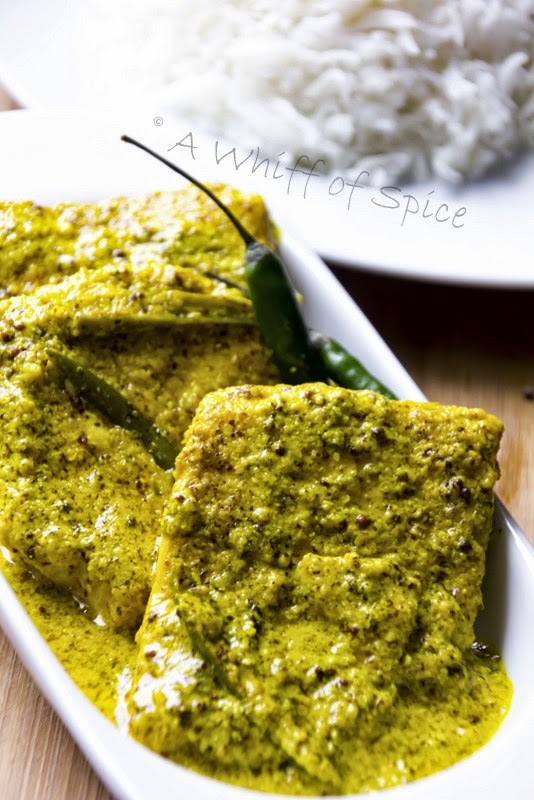 I made doi shorshe Ilish but forgot that extra dash of raw mustard oil. Now this looks wonderful. A dish for all the senses. Great to look at. Aromatic. And I'm sure delicious. Great post! Soul food recipes is still the ultimate comfort food as revealed by a current poll. But quiet changes continue to take place as consumers demand healthier diets. See what those changes are and how it can quietly affect you. Visual appeal makes customers want to grab that slice of oreo or blueberry cheesecake in your bakery. And galores of other creamy sweet and fancy treats you're selling as well. In your Baked comfort food food should not be simply look "good enough to eat", but splendidly yummylicious. Making them that way is going to guarantee you a good bunch of regulars and new customers.